Today, if we were going to rate the frequency of use of the different parts of our laptop, we’d probably consider our ExpressCard slot as rarely used, if ever. The ExpressCard slot came to being in 2003 and superseded the PC Card. It was widely used by digital cameras and video recorders but was eventually thrown out of power by the USB. Many laptops sold in the last five years still have ExpressCard slots but since it’s barely used and eats quite a big amount of space in the netbook body, some consumers said the slots are better off as USB ports. 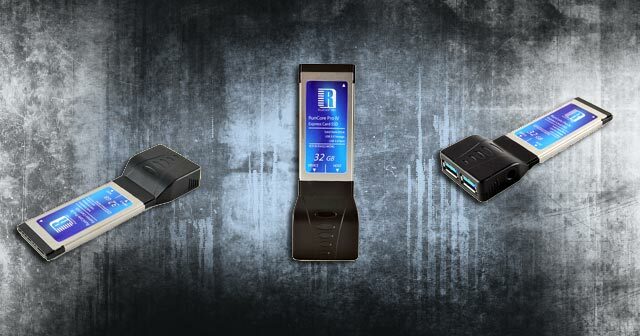 As a result, China-based manufacturer of solid-state storage devices, RunCore, has come up with a unique solution: the RunCore Pro IV, a 2-in-1 device that is specially-designed for notebook computers with ExpressCard interface. The RunCore USB 3.0 Express SSD has two high speed interfaces. One is the host interface where you can get high-speed access to notebooks with SuperSpeed. The other is device interface, which makes the product a high-capacity removable storage device which can be connected via any USB 3.0 port. This hybrid SSD may look odd but it does work better than it looks! The slim solid-state drive is plugged into the card slot on the side of the netbook, making it useful as a storage device. Once plugged in, you’ll be surprised to see two USB 3.0 ports that are ideal for transferring data to and from your USB-compatible gadgets at a rate of 5 GB/s! The device sticks out horizontally so you wouldn‘t have to worry about space being wasted. On top of that, the device’s backward compatibility allows it to accept USB 2.0 connectors, too! With a size of 116.5mm X 34mm X 4.8mm and weighing barely 100 grams, the USB 3.0 ExpressCard comes in 32GB and 64 GB. It can read quicker than 110 MB/s and writes faster than 80 MB/s. This duo functional device comes with a bunch of special features including Intelligent Bad Block Management, Dynamic and Static Wear Leveling, Defect Management, Sudden Power-Off Recovery, and Intelligent Recycling for advanced free space management. Unfortunately, RunCore still has no word on the pricing and global availability for its ExpressCard Adapter, which means your ExpressCard would need to wait for a little longer before getting its life back. Would a 2-in-1 USB 3.0 ExpressCard be helpful to you? Don’t forget to tell us what you think! This entry was posted in Articles, RunCore, USB 3.0, USB 3.0 Express SSD, USB Devices, USB Gadgets and tagged Express Solid State Card, ExpressCard Slot, hybrid SSD, RunCore, RunCore Pro IV, RunCore USB 3.0 Express SSD, USB 3.0 ExpressCard, USB 3.0 SSD Card. Bookmark the permalink.